Scene from a past presentation at Saint Anastasia. 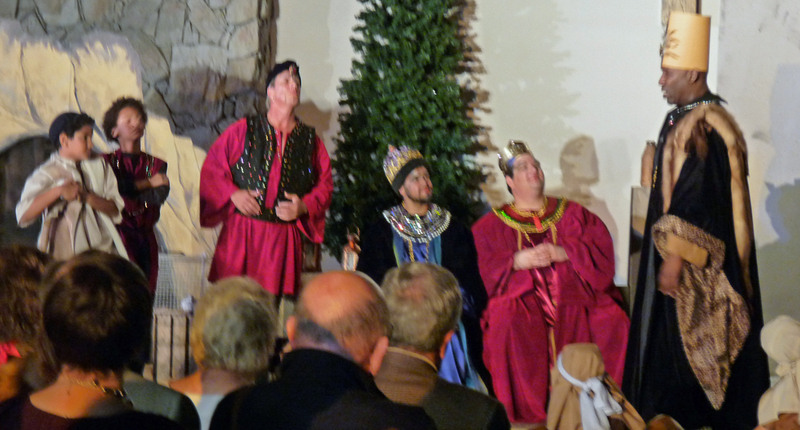 SAINT AUGUSTINE – The search begins for performers in a locally produced holiday classic Amahl and the Night Visitors. Auditions will be held from 1 to 5 p.m., Sunday, Sept. 9, at St. Anastasia Catholic Church, 5205 A1A South on Anastasia Island. Amahl and the Night Visitors is a one-act opera by Gian-Carlo Menotti. The story revolves around a crippled shepherd boy and his mother when three kings appear unexpectedly at their door. What transpires, once they are admitted, is a lesson on how faith, charity, love and good deeds can work miracles. Nance and Morin are seeking talented youth including an 8 to 12 year old soprano to play the part of Amahl, the young crippled boy. Another major roll is that of a male baritone, approximately 16 years or older to play the Page, an attendant to the kings. Males and females of all ages and vocal ranges are also invited to audition for the vocal and dance ensemble. Auditions, rehearsals and the performances will be in the new Celebration Hall in the St. Enda Building located adjacent to the church. Rehearsal schedules will be set in conjunction with cast availability. Auditions are on a walk-in basis. Advance scheduling is not required. For information contact joann.nance@stjohns.k12.fl.us, staccmusic@aol.com or call the church office at 471-5364.